Tiger Woods is (er, … was?) one of the greatest golf talents ever. His meteoric rise to dominate the golf scene is historic. I still remember watching in amazement as this 21-year-old golfer won the 1997 Masters by 12 strokes! He looked unbeatable. Over the years, I have very much enjoyed rooting for him to win. Jack Nicklaus saw it coming. In an interview with Billy Morris, on April 10, 1996, Nicklaus said, “Arnold and I both agree that you could take his Masters and my Masters and add them together, and this kid should win more than that. This kid is the most fundamentally sound golfer that I’ve ever seen at almost any age. … I don’t know whether he’s ready to win yet or not, but he will be your favorite for the next 20 years. If he isn’t, there’s something wrong.” Well, seeing the above chart, something is wrong. For 719 weeks in a row (almost 14 years), Tiger Woods was ranked as #1, #2, or #3 in the world. Yet, now, he has fallen out of the top 50. It is no accident that his fall has coincided with the exposure of his sexual sin (in November 2009). He hasn’t won a tournament since. 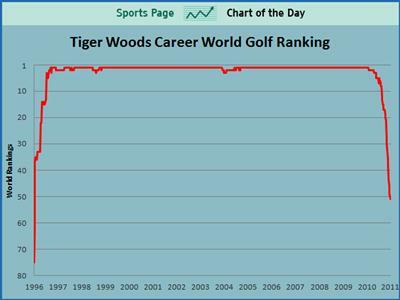 The reason he didn’t lose his #1 ranking earlier than October 2010 is because the world rankings take into account all the golf tournaments for the past two years. He was so dominant that without even playing very much (or very well), it took nearly a year to lose his #1 post. I’m hoping that he can regain his form and be #1 again. Learn the lesson of Tiger’s fall. Sin will destroy you. Don’t be deceived, “be sure your sin will find you out” (Numbers 32:23). Sooner or later, your sin will come to light. When king David kept silent about his sexual sin, he said, “my body wasted away through my groaning all day long. … My vitality was drained away as with the fever heat of summer.” After more than a year, David finally confessed his sin to the Lord and found forgiveness. He spoke of the blessing that “How blessed is he whose transgression is forgiven, whose sin is covered!” (Psalm 32:1-5). What’s David’s counsel to us? “Let everyone who is godly pray to You in a time when You may be found” (Psalm 32:6). So turn to Christ today, while grace and mercy awaits and know the joy and relief of forgiveness of sins. I am amazed at how quickly our hearts can turn from faith to unbelief. At one point in the wanderings of Israel, some of them were taken captive by the king of Arad. But Israel prayed to the Lord, who heard their voice and gave Arad into their hands (Numbers 21:1-3). They all saw the clear answer to prayer and how God was guiding them and guarding them. Yet, in the very next verse, we read of how the Israelites became “impatient” and spoke against Moses, “Why have you brought us up out of Egypt to die in the wilderness?” (Numbers 21:4-5). “Lord, I believe. 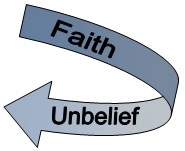 Help my unbelief” (Mark 9:24). There are some sins that we commit, that just don’t seem so bad. Everyone does them, so we think that we are justified in joining in. At these moments, God’s perspective always helps us to set it straight. One of my constant sins is complaining. Reading Numbers 11 recently helped to put things in perspective. Israel had been delivered from slavery by the mighty hand of God. God had protected them and was providing for them every day. But, it was not enough for them. They complained at the food, being tired of manna. So, God responded to their complaining. He did so in a way to show how He hated their complaining. God gave them fresh meat by shifting the weather and providing quail across the land, whey they gathered and ate. Here’s what we read, “While the meat was still between their teeth, before it was chewed, the anger of the Lord was kindled agains the people, and the Lord struck the people with a very severe plague” (Numbers 11:33). Some died in this plague. I’m going to try to think of Numbers 11 the next time I’m tempted to complain. A few days ago, Osama bin Laden was killed by American Navy SEAL forces in Abbottabad, Pakistan. Surely, there will be much buzz about this in the news for days and weeks to come. I want to draw a spiritual parallel for us. Since the attacks on the World Trade Centers on September 11, 2011, Osama bin Laden has been the most famously sought after fugitive the world has ever known. He ran for almost 10 years after these attacks. As it turned out, he was living in a very elaborate compound and took special precaution not to be traced. Nothing came in. Nothing went out. The walls surrounding the compound were up to 18 feet high, all of them topped with barbed wire. There was no internet or video coming into the compound. The garbage was burned. Yet still, he was found out. You may be trying to hide your sin, from people and from God. You may have built fortresses around your sin. You may be very careful in what you say and what you do, so as not to allow any detection of this sin from the outside world. You may have been successful for years in hiding. But, be sure, that God knows of your sin. It will be revealed. If not in this life, it will be in the life to come. In Numbers 32:23, God promised the nation of Israel, “Be sure, your sin will find you out.” The promise is still true for us today. However, today is a day of mercy. Believe in Jesus Christ, and your sins may be forgiven. So, flee to him while there is time, lest you face the day when God invades your compound. In that day, there will be no mercy.